Society’s use of energy is one of the most significant factors contributing to climate change. According to the National Round Table on Environment and Energy (NRTEE), to address the impact of energy on climate change, we need to look at two key areas: how we use energy; and how we produce energy. The Renewable Energy Program addresses this latter issue. The Energy Trail at Kortright provides one of the largest renewable energy demonstrations, training and education programs in Canada. Click here for more information. The Renewable Energy Road Map is a project to identify the most strategic actions needed to move the market for renewable energy technologies. Click here for more information. In February 2009, Toronto and Region Conservation (TRCA ), in conjunction with York University’s Faculty of Environmental Studies, issued a report entitled: Ontario’s Road Map to Prosperity: Developing Renewable Energy to its Full Potential, which analyzes barriers to renewable energy and lays out a series of recommendations. The road map is based on three crucial principles that form the foundation for achieving the multiple benefits of developing renewable energy sources to their full potential in Ontario. Establishing a robust domestic market that prioritizes sustained renewable energy development. Development of a strong financial infrastructure that ensures that Ontarians can actively invest in renewable energy development. Strengthening the province’s educational networks to develop the skilled workforce required to manufacture, design, install and maintain renewable energy systems and all associated support infrastructure. On June 19, 2009, key players in the renewable energy field gathered for a workshop to analyze the barriers to renewable energy discussed in the report, and recommendations in light of Ontario’s Green Energy and Green Economy Act and to derive practical ideas to address local issues and opportunities to achieve its goals. You can also download the Workshop Presentations below. 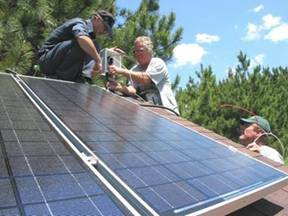 Toronto and Region Conservation is seeking to drive greater adoption of rooftop solar on buildings by landowners and facility managers across the greater Toronto area and beyond. 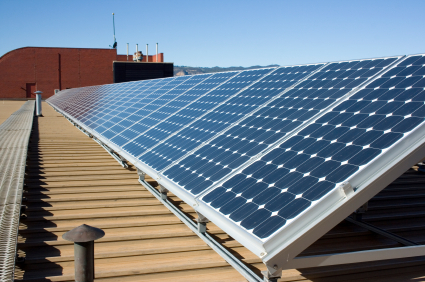 The Rooftop Solar Program is a project to understand the issues, barriers and solutions to move the market for rooftop solar in industrial and commercial developments. Rooftop Solar Research – research on local, national and international case studies of rooftop solar installations. This will include a review of the related legislation and policy frameworks in the municipalities, Province of Ontario and Government of Canada. Focus Group Interviews – through one-on-one interviews, the core issues and barriers that limit the implementation of roof top solar projects will be identified. Stakeholder Workshop – utilizing the rooftop solar research and case studies, along with a draft report of recommendations, a stakeholder workshop will be hosted with no more than 50 key stakeholders. The purpose of the stakeholder workshop is to highlight the possibilities of roof top solar gleaned from the background research and to ground truth the recommendations with stakeholders. Final Report – based on the input received at the stakeholder workshop, the report and its recommendations for implementation by TRCA and its partners will be finalized. The Business Case for Alternative Energy Technologies in Ontario report articulates, in simple terms, the financial case for specific renewable technologies and target audiences in Ontario. 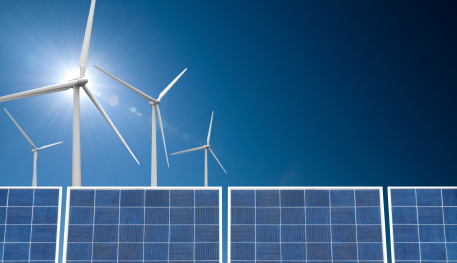 With the new Feed-in-Tariffs (FIT) under development by Ontario Power Authority, the business case for wind and solar will change significantly. Once the FITs have been approved we will update their business cases. One of the biggest barriers to adopting renewable energy has been the scarcity of good business cases. The rationale for using renewable energy has generally been dominated by the argument that “it’s the right thing to do” because it helps to reduce greenhouse gas emissions. In recent years the situation has changed. Advancements in renewable energy technology; the rising costs of oil, gas and electricity; incentives; standard offer contracts for renewable electricity; emissions trading markets; and the desire of corporations to associate themselves with ” green” as a means to attract and retain customers are all transforming the business case for renewables. The purpose of the report is to develop a better understanding of the economic benefits of renewable energy and disseminate that knowledge to the marketplace. The project considers business cases for five target audiences: homeowner, commercial, small to medium business, institutional, and investor. The specific renewable energy technologies studied are: solar PV; ground source heat pumps (GSHP); solar thermal – air and water; and wind. This project is a research partnership between the Toronto and Region Conservation Authority and the University of Toronto. It was supported by Peel Region and the Citizens Bank. TRCA’s Presentation on Underground Thermal Energy Storage (UTES) Was a Success! A diverse group of people, including representatives from municipal and provincial governments, universities, businesses, utilities, and the non-profit sector came together to learn about and discuss Underground Thermal Energy Storage (UTES). Underground thermal energy storage is an innovative technology, which enables seasonal storage. UTES has been well researched and tested in many European countries but has only recently been implemented in a few locations in Canada. In Europe, these technologies are now considered commercial and are becoming popular in office towers, communities and institutional buildings. In an increasingly energy-constrained society, UTES presents a significant opportunity for the interseasonal transfer of energy. Aart Snijders’ visit to the Greater Toronto Area from the Netherlands was timely because Toronto and Region Conservation and our partners are planning to look at the technical potential for Aquifer Thermal Energy Storage (ATES) and Borehole Thermal Energy Storage (BTES) in the GTA in 2009. Aart Snijders’ presentation included an overview of the aquifer thermal energy storage (ATES) technology development and implementation in Europe. He discussed ATES system operating principles, along with the recent regulatory framework in Europe. Bill Wong reviewed borehole thermal energy storage (BTES) technology and gave a comprehensive overview of the successful implementation of the first large scale BTES system in North America in Okotoks Alberta. Mr. Aart Snijders holds a Master’s degree of Science in Physics from the Eindhoven University of Technology, specializing in heat and mass transfer engineering. He has worked in the energy field since 1979 and, in 1983, became the head of the energy consultancy and engineering group for what is now Arcadis N.V. He was responsible for the development of ideas on energy efficient HVAC systems by utilizing aquifers for cold storage and designed several aquifer thermal energy storage projects. Starting in 1987, he was involved in research work in the field of Underground Thermal Energy Storage, which was performed in cooperation between specialists from other countries within the framework of the International Energy Agency (IEA). In 1990, he established IF Technology bv, Arnhem, along with an associate, to promote the development and market deployment of new energy technologies and ATES in particular. The company has grown to 55 employees and is a leader in the field of underground thermal energy storage. Their achievements include the design and commissioning of over 300 medium- to large-scale projects with seasonal underground storage, including those in the Netherlands, Belgium, and Norway. IF Technology International, based in Arnhem, the Netherlands, specializes in developing products and technological tools in the energy and environmental fields. Working in the field of renewable energy since 1989, IF Technology is the leading aquifer and borehole thermal storage design and engineering company in Europe. IF Technology also designs and implements large-scale ground coupled heat pump systems. IF Technology has successfully completed over 300 projects utilizing underground thermal energy storage (UTES) technologies in Europe. IF Technology (IF Tech) bring their vast amount of valuable real project implementation experience and learning points to the project team. Mr. Bill Wong, P.Eng, a senior project manager and a process specialist, has over 25 years of technical and business experience in the environment, energy and healthcare sectors with expertise in project/program management, technology development and process facilitation. He is currently the program manager of SAIC Canada’s renewable energy and climate change program. Mr. Wong has been the project manager for a large-scale residential project in Okotoks, Alberta involving solar thermal energy, underground thermal energy storage, district energy system and building energy efficiency implementation (Drake Landing Solar Community, Okotoks, AB). He also managed and led the feasibility study, field testing and detailed design for the Okotoks solar project. Currently Mr. Wong is providing services to the City of Medicine Hat, the City of Regina, the City of London, the Town of Markham and the City of Yellowknife on a number of feasibility studies on renewable energy based community energy systems. Mr. Wong holds undergraduate (nuclear and thermal power, 1979) and graduate (solar energy, 1981) degrees in engineering from the University of Toronto and a Masters degree in business administration from the University of Ottawa (1991). SAIC Canada is the Canadian subsidiary of SAIC, which is a multi-national high-technology research and engineering company, providing products and services to commercial and government customers in energy, environmental systems and engineering, systems integration, information technology, telecommunications, national security, health systems and services and transportation. Since its founding in 1969, SAIC has grown into a company of more than 44,000 employees in 150 cities worldwide and over US$8 billion in annual sales. SAIC is a Fortune 500 company (number 298, April 2007). SAIC Canada’s Renewable Energy and Climate Change Program has successfully completed the feasibility study, design management and project implementation of the Drake Landing solar seasonal storage demonstration project in Okotoks, AB.